I recently went to see The Big Lebowski in a cemetery. As a resident of the City of Angels, I have opportunities that people who live in other parts of the country don’t. I get to hike canyons without having to leave the city limits, I get to wear flip-flops in December, and, sure enough, I get to see some of my favorite films screened in an enormous cemetery. This is part of a summer series of movie screenings that are projected on the wall of a building in the Hollywood Forever Cemetery. This is similar to how they show movies in Bryant Park in NYC, but with gravestones. Lebowski recently surpassed The Princess Bride as my favorite movie, so when my buddies suggested we go see it on the big wall, I…liked their suggestion. I also bought a ticket straight away. What none of these people seem to understand, though, is that “travesty” means something completely different from “tragedy.” A “tragedy” is an event that causes great suffering, or even a play that ends with the downfall of the main character and probably a lot characters dying. A “travesty” is a work of grotesque satire, likely with the intent to destroy the subject of the parody. A poor family losing their home is a tragedy, but if the father in that family made a short film that satirizes the local politicians in an effort to destroy their chances of winning the upcoming election, then he would have made a travesty of their candidacy. Did Walter create a travesty of Donny’s funeral? Getting ashes all over The Dude’s beard and clothes certainly seems grotesque, and given how much Walter yelled at and demeaned Donny the whole movie, it’s likely that there was a subconscious intent to destroy the solemnity of his memory as well. The Dude has no job, no focus, and without the events of this movie, no real purpose in life. But, unlike half of the American population, he understands what the word “travesty” means. 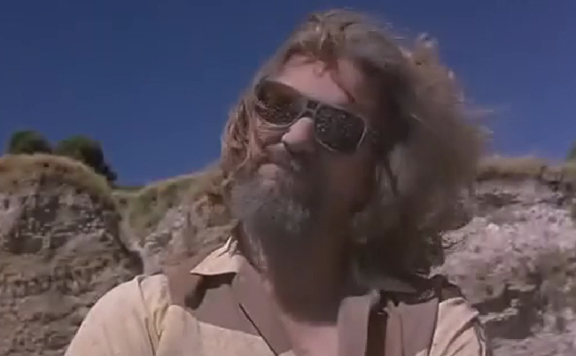 Before I went to that cemetery to watch the film with my buddies, I was able to come up with a gazillion billion reasons why The Big Lebowski is the greatest movie of all time. But, after seeing that scene again, I came up with reason gazillion-billion-and-one.